'He was reduced to earn his daily bread by painting coarse and hasty pictures for the Feria (weekly fair) held in a broad street branching from the northern end of the Old Alameda and in front of the old church of 'All Saints', remarkable for its picturesque semi-Moorish belfry. This venerable market presents every Thursday an aspect which has changed but little since the days of Murillo. Fruit, vegetables, and coarse pottery, old clothes, old iron, still cover the ground or load the stalls as they did two centuries ago, when the unknown youth stood among the gipsies, muletters, and mendicant friars, selling for a few reals those productions of his early pencil, for which royal collectors are now ready to contend.' - Sir William Stirling-Maxwell, Annals of the Artists of Spain. Henry McConnel, by 1873; Christie's, London, 27 March 1886, lot 80 (3,800 gns to Silva White). James M. Keiller, Dundee; Christie's, London 25 May 1895, lot 94 (3,800 gns to Davis). London, Royal Academy, 1865, no. 156. London, International Exhibition, 1873, no. 1329. Manchester, Royal Jubilee Exhibition, 1887, no. 595. London, Royal Academy, Winter 1894, no. 11. With the possible exceptions of the Landseer, the Deverell and the Waterhouse, no picture in the collection is more obviously a 'museum picture' than John Phillip's Early Career of Murillo. How does one define this patently elastic term? The picture must be self-evidently important, an undisputed masterpiece by the painter concerned, whatever his or her place in the artistic hierarchy. And although it could fit happily into the right domestic setting - a setting, after all, for which it may well have been painted if it was not painted for a church, a palace or a civic hall - we somehow see it today in a museum context. While the picture's subject may be charming and delightful, it is perhaps more likely to be 'difficult', too demanding for most of us to have around the house. This may mean anything from a gruesome martyrdom to something a little academic and of essentially art-historical interest. The picture must also make some definite statement, say a lot about the artist, his period, the forces - cultural, social, religious, political, or whatever - that went into its making. It has, in this sense, a powerful didactic dimension. Finally, although this is no more essential than the academic subject, the picture may well be large, too big to fit comfortably into the flat or modest residence but ideal for the museum wall. It has, in fact, 'wall power', the capacity to arrest attention, provoke discussion, and tell us about our past. Phillip's picture, which fulfills so many of these critera, was exhibited at the Royal Academy in 1865, two years before his early death at the age of fifty. Born in Aberdeen, the son of a shoemaker, Phillip came to London and entered the Royal Academy Schools in 1837. He was soon a member of the Clique, a coterie of R.A. students who saw themselves, in time-honoured fashion, upsetting academic conventions. Nothing much came of the venture, and perhaps its primary interest is that it anticipated the founding of the Pre-Raphaelite Brotherhood a decade later; but some interesting artists were involved, including W.P. Frith, Henry Nelson O'Neil, Augustus Egg and Richard Dadd, as well as Phillip himself. Phillip was to marry Dadd's sister in 1846, although, like her brother, she turned out to be mentally unstable and had to be confined to an asylum. In 1839 Phillip had returned to Aberdeen, where he remained for the next seven years. His early pictures are genre scenes in the Wilkie tradition, but in 1851 he paid the first of three visits to Spain and began to specialise in the Spanish subjects which were to earn him the sobriquet of 'Spanish Phillip'. In fact even this was not really a departure from the Wilkie model, since Wilkie himself had visited Spain and begun to paint Spanish themes in the 1820s (see lot 303). Like Wilkie, moreover, Phillip first visited Spain in search of improved health. He was to return for prolonged stays in 1856-7 and 1860-1. Phillip was an immensely competent artist, his work distinguished by a boldness of handling and a strong sense of colour and chiaroscuro which seem typically Scottish. Spain bought out these characteristics, and the resulting paintings are dazzling evocations of Spanish life at its most picturesque and exotic, delighting in dramatic contrasts of light and shade and brilliant local colour illuminated by strong sunlight. His masterpieces in this genre are nearly all in Scottish public collections. La Lotteria Nacional: Buying the Tickets, begun in Seville in 1861 and not quite finished at his death, is in the Museum at Dundee, while its sequel. La Lotteria Nacional: Reading the Numbers, together with La Bomba (1863), are at Aberdeen. But the most famous example is La Gloria, exhibited at the R.A. in 1864 and acquired (at Christie's) by the National Gallery of Scotland, Edinburgh, in 1897. The subject is a wake for a dead child and Phillip draws out all the stops, deliberately emphasising the poignant contrast between the private grief of the mother and the raucous merrymaking going on only a few feet away. The Early Career of Murillo, exhibited at the R.A. a year after La Gloria, takes its subject from the youth of one of Spain's most celebrated and popular artists, as told by Sir William Stirling-Maxwell in his Annals of the Artists of Spain (1848). 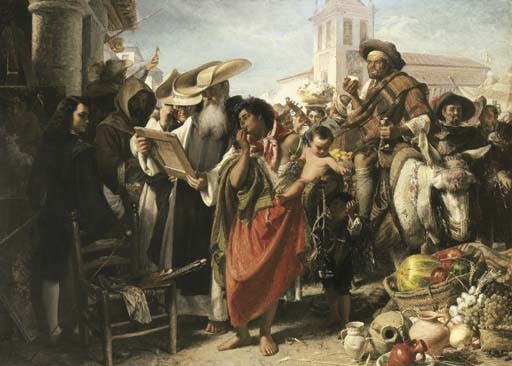 Murillo is seen at the age of seventeen, standing in the market-place at Seville, where he was born in 1617 and worked for most of his life. One of the 'coarse and hasty pictures' which he is compelled to paint for a living and sell at fairs - a pintura di feria, as it would still be known in Spain - is being examined by a priest, a gypsy woman and other local connoisseurs, but his higher ambitions are suggested by the pictures behind him on the left. The one on the ground seems to be a version of one of his most popular compositions, The Infant St John with the Lamb. One of these had been in the National Gallery since 1840, as Phillip probably knew, although he would have seen others in Spain. Phillip's feeling for Spanish culture went far beyond the more picturesque aspects of daily life. He was genuinely interested in Spanish painting, and one of the first British artists to appreciate Velazquez. In 1860 he bought Whistler's painting At the Piano (Taft Museum, Cincinnati), which reflects a similar taste among the avant garde in Paris. There is probably an article to be written (if it has not been written already) on the critical fortunes of Murillo in England. Phillip's painting would be a key document, as would the diaries of a collector with whom Christie's has been much involved lately, William Gibbs of Tyntesfield. Gibbs had a passion for Murillo, probably inspired by early visits to the Dulwich Picture Gallery but nurtured over the years by an ardent Anglo-Catholicism and prolonged spells of living in Spain to run the family business. When he paid his final visit in 1853, at last with some time on his hands and the money to buy pictures, he went to great lengths to study Murillo in Seville and to secure examples for Tyntesfield. What makes all this interesting in the present context is that Gibbs was also an admirer of John Phillip, buying his genre scenes and commissioning him to paint family portraits. Phillip's picture brings together many strands in his artistic personality - his lifelong indebtedness to Wilkie, his intense feeling for Spanish life and devotion to Spanish painting. But although in this sense it is highly personal, it also belongs to one of the most popular genres in nineteenth-century painting, the depiction of scenes, often highly fictionalised scenes, from artists' lives. The phenomenon was international. Nowhere did it flourish more vigorously than in France, as Francis Haskell showed more than thirty years ago ('The Old Masters in Nineteenth-Century French Painting', Art Quarterly, vol. XXXIV, vol. I, Spring 1971, pp. 55-85). Ingres, Vernet, Delacroix, Cogniet, Ribot, Delaroche and even Manet, not to mention many less familiar names, made significant contributions. Haskell calculated that during the heyday of the fashion, the 1820s to the 1850s, there were often as many as twenty examples at the Salon. But in England, too, there was no shortage of these themes: Titian's First Essay in Colour by William Dyce (fig. 1); three early works by Leighton - The Death of Brunelleschi (fig. 2), Cimabue's Madonna, and Michael Angelo nursing his Dying Servant; or Rossetti's drawings of Fra Angelico and Giorgione painting (fig. 3), these are just a few examples that leap to mind. There are literary parallels, too - Stirling-Maxwell's lives of the Spanish masters which inspired John Phillip; equivalent works on the Italian and Flemish schools by the indefatigable Anna Jameson; or Robert Browning's poems on painters - 'Fra Lippo Lippi', 'Andrea del Sarto', 'Old Pictures in Florence' - in Men and Women. Here again, it seems, is an article to be written, an English version of the Haskell model, and once more we can see Phillip's picture being a prominent if rather late exhibit. Almost all the works mentioned above, pictorial and literary, date from the 1840s or the 1850s (the exception is Leighton's Michael Angelo, which is 1862). By the 1860s the taste for these subjects was waning in France, with numbers at the Salon down to three or four per annum. No doubt analysis would reveal a similar trend in England. a picture which could command a master position in any gallery in Europe, ancient or modern. A work of this signal power and resource might serve as a landmark to show the goal whereunto contemporary art had reached. This, the master-work of Mr Phillip, is...specially to be commended for the bold breadth of its handling, which stands out as a protest against the littleness of manner, that niggling detail in execution, which some years ago threatened to sink our English school into contempt...this picture will be remembered as one of the decisive triumps of realism, strong throughout in graphic character, emphatic in local circumstance, (and) truthful in all essential features of time and place. In fact Phillip's reputation remained high for at least another twenty years. In 1873 he was accorded a complete section to himself at the International Exhibition in London; 329 works were shown, including, of course, Murillo. He was also the subject of a memorial exhibition at Dundee in 1880. Meanwhile his pictures commanded high prices in the saleroom. Murillo twice fetched 3,800 guineas in the 1880s and 1890s, and in 1897 La Gloria was bought for the National Gallery of Scotland for no less than 5,000 guineas, the highest price they had paid for any picture to date. But in time Palgrave's prediction was confirmed. A distinctly critical note can be traced in the comments made from the 1880s on by such critics as Sir Walter Armstrong, R.A.M. Stevenson and James Caw. Perhaps only in recent years has the subject been seen in perspective.